KILLINGTON – There doesn’t seem to be a lot of enthusiasm for public service in Killington this year. That means the position has a contested race this year. Wonsor said petitions need to be returned by Monday, January 26. One of those who hasn’t taken a petition out is Selectman Chris Bianchi, whose wife, Betsy, said he hadn’t made his mind up yet. Attempts to speak directly with Bianchi were not successful. 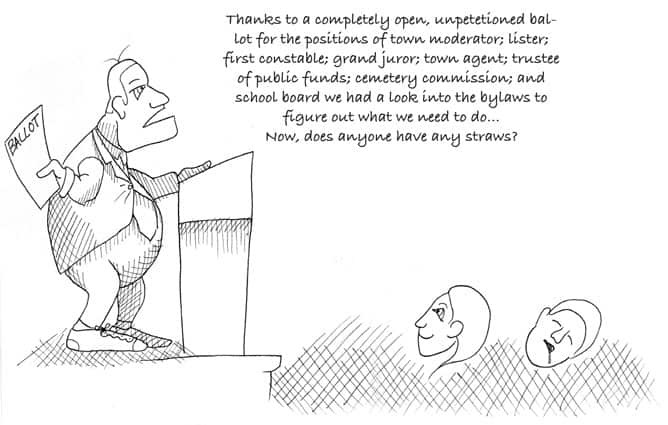 Besides selectman, positions needing candidates are: town moderator; lister; first constable; grand juror; town agent; trustee of public funds; cemetery commission; and school board. For further information, Wonsor can be reached at 422-3243.